These nutritious oatmeal muffins with peanut butter, chia, and chocolate are easy to make vegan and/or gluten free. I’m happy to report we made it through the first week of school. And with very few tears, at that! My second grader got to school and bolted off to meet her friends on the playground with nary a glance in my direction. My kindergartener, on the other hand, looked at me with big doe eyes filled with a mix of excitement of nervousness about a new classroom, new school, and new friends. To celebrate the first week, we made these luscious peanut butter, oatmeal, chia, and chocolate chip muffins. As usual, they are free of refined sugar, and easy to make vegan and gluten-free if needed. 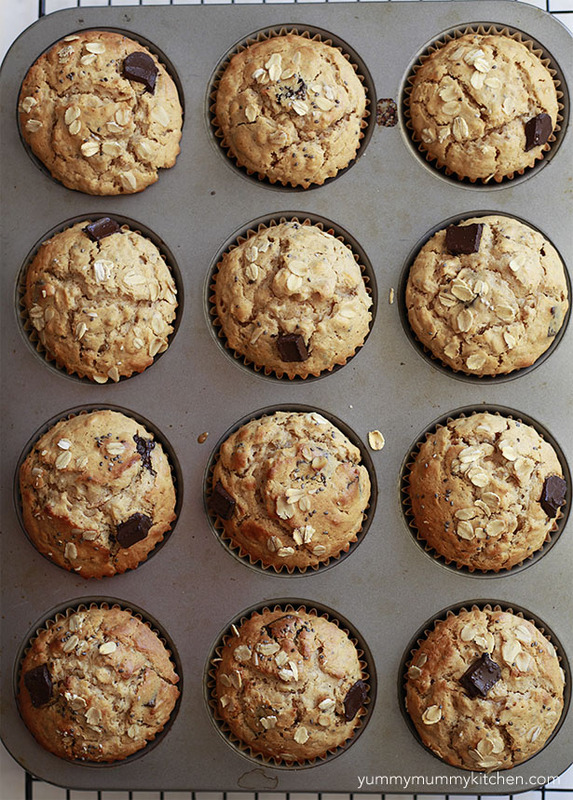 These muffins are higher protein and fiber than most, thanks to peanut butter, oats, and chia – so they are extra filling and nourishing. So much different the the sugar laden grocery store muffins. They are a snap to make – and start to finish take about 25 minutes. I love adding superfoods like chia to baked treats. They add a nice little crunch and extra nutrition. I fill my muffins 3/4 of the way to the top so that they are nice and tall when the come out of the oven. Oh! I have to tell you about my all-time favorite muffin liners… So many friends ask why my muffins never ever stick to liners. I use these zero-stick parchment cups. Warm and fluffy! The best way to enjoy these muffins. We like to add a dollop of extra peanut butter or butter on these. If you prefer the pb&j flavor to peanut butter and chocolate, feel free to omit the chocolate and instead add a teaspoon of jam on top of the batter. These hearty muffins are not overly sweet and make and tasty breakfast or after school snack. Enjoy, friends! 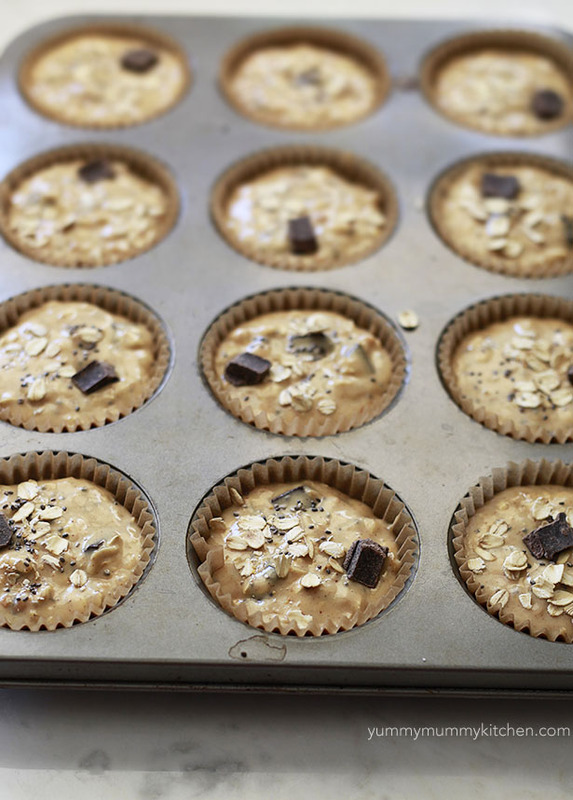 Nutritious muffins with oats, peanut butter, chia seeds, and chocolate are a tasty breakfast or snack. 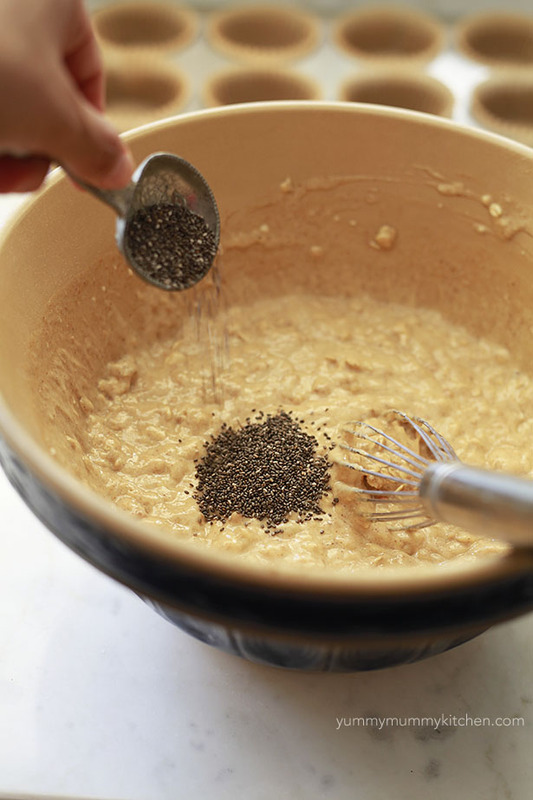 In a medium bowl, whisk together the oats, flour, salt, and baking powder. In another medium bowl, whisk together the honey/syrup, peanut butter, milk, eggs, and coconut oil until smooth. You may really have to beat it to incorporate the peanut butter. Stir the dry ingredients into the wet mixture until smooth. Fold in chia seeds and chocolate. These muffins are best the first day they are baked and we like to eat them with a little more peanut butter or jam on top. *Lily's Sweets makes excellent stevia-sweetened chocolate chips. Enjoy Life is a brand of tasty vegan and gluten free chocolate chips. See, chocolate can work with any diet! Gluten Free Option: Be sure to use gf oats and flour. I like King Arthur Gluten Free Flour. Vegan Option: Use 2 flax eggs and maple syrup instead of honey.